I would’ve thought that anyone above the age of, oh, I dunno… five, would have the common sense not to sip a hot liquid through a straw. 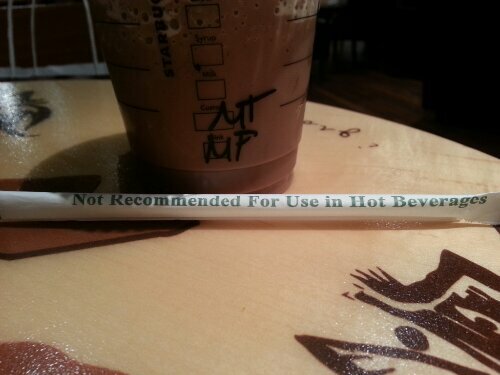 Honestly, anyone of sound mind and body who, of their own volition, uses a straw to drink a hot beverage deserves to have their tongue and throat burnt. But I suppose after the infamous lawsuit that resulted in dire warnings on paper coffee cups all over the world, common sense has had to take a backseat to litigation risk. Since then, we’ve seen similar messages on packets of peanuts and bottles of peanut oil, warning the litigious consumer that the clearly labelled peanut product he or she has picked off the shelf, may contain nuts. Nobody is disputing the fact that peanut allergies can be fatal, but I have enough faith in my fellow consumer, both allergy-ridden and allergy-free, to have the minimum number of grey cells required to comprehend that a packet of peanuts, would presumably, contain nuts. That should cover most of it. This entry was posted in Blog and tagged common sense, dire warnings, hot beverages. Bookmark the permalink.